Cork It or Cloth It? 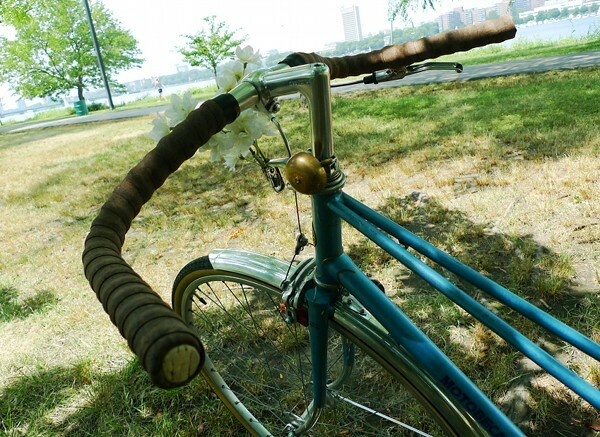 When it comes to wrapping handlebars, the typical options are cloth tape and cork tape. And my impression is that many, if not most, cyclists today consider cork tape to be more comfortable. On the surface this makes sense: cork is softer, and gripping something soft ought to feel better than gripping something hard. However, I generally prefer cloth tape. This tends to surprise people, but here is my reasoning: I feel that the softness of cork tape can be counterproductive, because it necessitates a tighter grip. When I ride a bike with cork handlebar tape it initially feels cushy, but over time I notice that the cushiness is making me grip tighter and my hands grow tired from the exertion. Because cloth tape is firmer, it allows my hands to relax and I am not perpetually squeezing. Of course, in order for the firmness of cloth tape to work in one's favour, the handlebars must feel comfortable to begin with. The handlebars on my vintage Trek (first picture) have a weird squared-off (rather than tubular) shape to them, which my hands refuse to conform to. So until I can afford better handlebars on that bike, I am using cork tape to disguise the square shape. 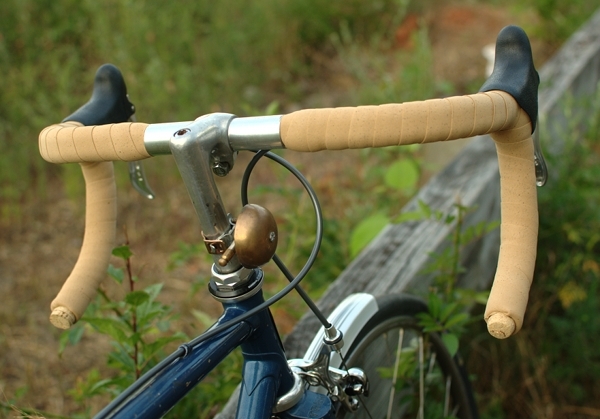 Similarly, I always had some form of cork tape or grips on the vintage Motobecane mixte I used to own, because its aggressive geometry would place too much pressure on my hands. But once I managed to slacken the seat tube angle (with the help of a swept back seat post) and improve the hand position with the Belleville handlebars, holding the bars finally became comfortable and cloth tape felt better than cork. This makes me wonder whether the prevalence of cork tape we see today could generally be a symptom of uncomfortable positioning. Are more cyclists choosing cork tape because their position places too much weight on their hands? And furthermore, has this somehow become normalised in what is now considered "proper bike fit"? A number of times now, I have been approached by other cyclists and asked how I "can stand" having my handlebars wrapped in cloth tape, as well as how I manage to cycle without padded gloves. Don't my hands hurt? Well, no. I feel no pressure on my hands, so the bar tape is really just there to provide a pleasant surface texture to the handlebars, rather than to "fix" any discomfort issues. Since cork tape is fairly new, I wonder what those who have been cycling since "back in the day" think about the cloth vs cork issue. I've always preferred cloth over cork; like you, I find myself death-gripping cork. For the same reason, I prefer thin, hard MTB grips over foam grips. My guess is that this is highly individual, even on bikes set-up similarly. Regarding bike set-up, I don't think it's necessarily bad to carry some weight on the handlebars. For me, too little weight on the bars equals too much weight on the saddle. Ideally, I prefer what feels like an even distribution of weight between the saddle, handlebars, and pedals. 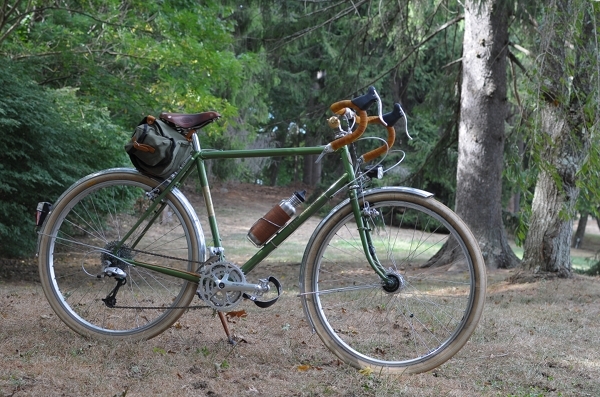 Oddly enough I just got a mixte with cloth wrapped bars, and after my first ride my hands ached. I originally thought it was the tape, it's not as soft etc, but after doing more research and talking with a bikey friend fond of drop bars in general I'm going to a: give my hands some time to adjust to the new position and b: look at adjusting all the other angles on the bike. I recently switched from cork tape to shellacked cloth tape. It seems very counter intuitive, but the hard cloth tape is more comfortable. I have a theory that softer contact points (saddles, bars) on the bike acted like a compressed spring and produces a constant upward force all the time. To the contrary, a harder contact point only creates an upward force on occasion. For instance, when I hit a pothole, a shock wave will travel up my fork and into my arms. If my elbows are bent, my elbows will absorb the shock. Maybe I am crazy, but it seems to work out in my head. As an added bonus, they look gorgeous and are more durable than cork. Hmm, maybe I ought to re-wrap my Motobecane's bars with cloth. That cork is getting long in the tooth and I could play with the brake lever position a bit. Also install bar ends and rid myself of squirrel ear shifters... You are not planning to use these rolls of yellow and orange cloth tape, I can haz, yes? "back in the day", late 70's to the 80's, in France, I was riding drop bars wrapped in cloth. Some fancier tapes may had some form of padding, but usualy it was just plain cloth. On comfier bars (what you call "north road", that kind of set up) it was plastic or latex. I had no idea there was such things as cork grips or tape. It was just not on the radar. I like the Fizik Mictrotex tape which is neither cork nor cloth. It is similar in texture to leather but is much lighter and grippier. I guess it's generically closer to cloth than cork. I love my cork tape and use it on everything. I prefer the look of the cloth tape, but it is not for me. I have no gripping problem with cork, I can relax my hands on it and it feels quite secure. I do use minimally padded gloves with leather palms and the combination is grippy when wet and works for me, but this is an old combination for me and quite natural. 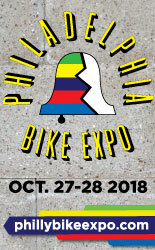 Plus, I have a great rasta theme going on my road bike and I cannot give up that striped tape.......shallow, yes, but comfy too. It doesn't look as good as any of your bikes, but it works with what I have. I LOVE the look of the elkhide, how is that for comfort? Seems like that would be the ultimate for looks, grip in wet conditions and long term wear. Oddly enough, I prefer vinyl tape! You would expect it to be slippery, but it's not, at least for me. 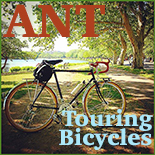 i agree with alan, in that an optimal setup is one in which your weight is fairly evenly distributed over the three contact points of the bike: the bars, the sadddle, and the pedals. however, this can never be achieved 100% of the time, as these distribution points vary with your speed and level of exertion. i don't think that one needs to "grip" the bars tightly to be secure: most of time i find myself just "gently resting" my hands on the bars, using them more as a loose placeholder than a firm attachment point for my hands. eric: i can understand what you're saying about cork versus cloth in terms of pressure points, but i would differ on the details: both are generating force against your hands; the only difference is that the pressure points are more evenly distributed over a broader area with cork; this reduces the intensity of force over any one point on your hands. this is one of the reasons cyclists wear gloves; they achieve (among other things) a similar effect as cork in terms of distributing force over a broader area. any padded layer will do this. i'm on the fence when it comes to cork versus cloth. most of my bikes have cloth, but two have cork (one road bike and one city bike). my one road bike with cork happens to be my most comfortable road bike, and i don't want to change anything about it. one of the reasons i think i might prefer cork on the road bike is that, when not exerting a lot of pedaling force (such as when coasting), more weight is on the hands, and the cushioning in those instances is welcome. Does anyone use leather tape? I've got the Brooks leather to match my saddle and it's pretty comfortable. It's pretty pricey unless you find a good deal, but I don't see myself having to change it anytime soon. I use different types of synthetic leather tape on my bikes. It seems really odd to me that you would grip cork harder than cloth. I think cork would be better at absorbing the road shock than cloth. But in the end, you should use what feels best to you. 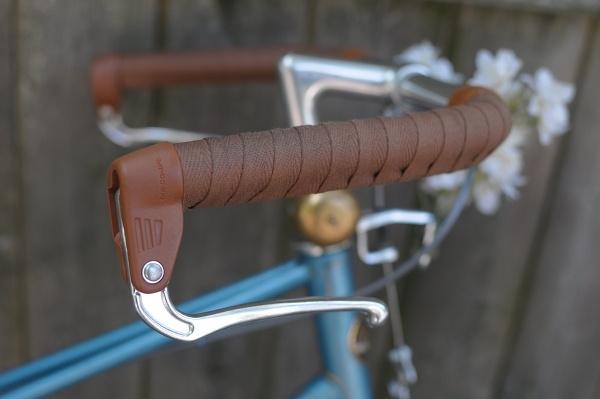 Re leather - I've just installed elkhide grips (over cloth tape) on my new mixte and this feels like the best handlebar wrap I have tried yet. The leather is firm and very nice to the touch. The elkhides are not too expensive, but beware that they are a pain to install. On city bars it's bad enough, but I think I would need some serious mental and emotional preparation before I could deal with sewing them onto drop bars. As for the Brooks leather tape, I am not a fan. The look reminds me of medical bandages. Plus it costs a fortune and cannot be re-used if you mess up. The surface texture feels more slippery than the elkhide grips, too. Brooks leather tape CAN be reused over and over again. That's the beauty of it. I've rewrapped my tape about 5 times already trying out different bars and they are still perfect. Like Brooks saddles, you pay more initially, but in the long run, they pay for themselves. Besides I think they look great and are really comfortable. Hmm that is good to know. Several people have told me they were not able to re-use it, because the tape either stretched or somehow got ruined in the process of being unraveled. Maybe there is a way to prevent that. For me, it's (1) availability and (2) aesthetics. For classically designed and painted bikes, I'd prefer cloth. For unusual paint (see the 'shiki or the 'dale at top) or modern bikes (CF, aluminum, etc), I'd go with cork, as long as it's still in keeping with the color scheme of the bike. As far as comfort, I don't really see much difference. I do find that cork gets sweat-slippery a whole lot faster than cloth - even with shellac covering the cloth. 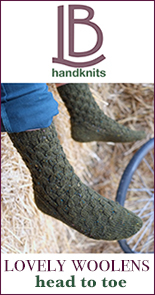 For anything under 30 miles, I don't see any difference, and for anything over that, chances are I"m using my Rivendell super-padded cycling gloves, so it doesn't matter much about padding either way. ANother thing to think about - some bikes came with rather narrow drop bars (especially those with low-end steel bars). On those, it might be best to go with cork tape, simply to make them fatter and easier to grip. Interesting. I never though about the difference soft versus firm handlebar tape could make. I've never ridden a bike with any kind of tape, so I can't add much value here, but your theory makes sense to me. I can say that I wear gloves to prevent callouses from forming during the summer when my hands sweat, not for padding. I resisted the cloth for a long time, thinking it had to be like the old 10 speed plastic/vinyl (sorry Tom) that I'd remembered as a kid. But a shellacking moment caused me to switch and I'm sold. I, too, find that the cushy cork causes me to excessively grip the bar and after a while, my hands fatigue. I also think I like the "skinny" bar with cloth. Even as a BMXer I shy'd away from the thicker grips so maybe this is reverting back to a a familiar feeling. I've got cloth on bullhorns and drops and I like it (I do find that I ride on the "hoods" a fair amount, so perhaps on my longer rides I'm "cheating"). Matthew - I don't like narrow drop bars either, which is interesting since I like narrow upright bars. I wonder what determines individual bar width comfort levels. ...also the leather tape does initially feel a bit slippery, but it only takes a short while for your body oil to soak into it, giving it a nice sheen and tacky feel. I don't like to wear gloves, and only the leather tape allows me to be glove free. My hands never sweat either, even when i'm racing on the hottest days. VO tape doesn't have the "medical" look that you dislike. While we're on the topic of aesthetics, why doesn't anyone make leather hood covers? That would be so sweet, and they would feel lovely. I like cork and cloth and use both, but lately my favorite has been the Fizik tape. It has just the right amount of cushion and grip and the texture feels wonderful. I like that it comes in bright colors for visibility. It's not a classic look per se but it's simple enough that it looks fine on a lugged steel bike, and you see it often at handmade bike shows. I've tried all kinds of bar wrap and only found one that I really didn't like. The old Benotto bar wrap was really too thin and difficult to wrap. I really like the Brooks leather wrap, but it is pricey. When I've used cloth or Fizik bar wrap I first install a base layer of cloth tape. I find this to be more comfortable. Also I don't like to feel a lot of pressure on my hands when I'm riding so I tend to tip the nose of my saddles up a bit. I prefer cloth tape because it makes me feel like I have better contact with the bike. I don't like any soft surface on the bars that my interfere with my grip. But I also wear padded gloves, not because my position is uncomfortable or I have too much weight on my hands, but because on long rides the vibration coming through the bars becomes uncomfortable on my wrists. The gloves help damp the vibration. I'm gonna go out on a limb, a non-vegan limb...I like leather tape, the brooks leather tape is very nice, and can be reused from bike to bike, covering the inevitable joins with cloth tape. And I was given by a very nice ebay seller leather selle anatomica bar tape to match the seat she was selling me - absolutely the nicest feeling tape, though the edges are not chamfered, so you feel the overlap a little differently. The upside is that leather is really comfortable to hold, a nice tactile experience, nicer than cotton or cork tape. The downside is that to do so, one doesn't wear gloves, and the one time in 30 years one takes a fall without gloves - one regretted it (happily a low speed blunder). I'm another big fan of Brooks leather tape. I love the way it mellows with age, acquiring character as the most used parts of the tape darken and shine. It's more comfortable than any other bar covering I've tried, and should last forever. Once in a while I use Proofide on it to prevent the less used bits from drying out, and that just adds to the beauty. Somervillan: I agree with you about positioning, at least for most cyclists (myself included). What you say also helps to explain why cork tape started to become popular around the mid- to late- '80's. That is when racers (especially in triathlons) started to use aero bars and when bikes with more aerodynamic positioning were being made. Such positioning, of course, puts more weight on a cyclist's hands. I used to like cloth tape, and I tried the Brooks tape recently. 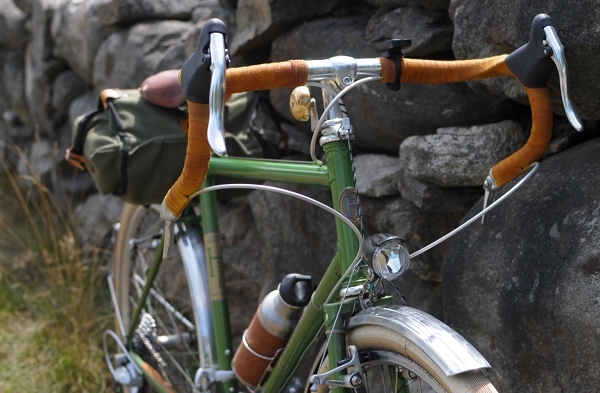 Cloth looks and feels classic, and the Brooks is simply beautiful. However, as people in my old neighborhood said, "I ain't gettin' any younger." No matter what my positioning is, my hands and wrists have always been sensitive to vibration, and are more so now as I age. So cork it is for me. On the other hand, I did wrap my Porteur bars on my new Miss Mercian in the Fizik wrap Steve mentions. 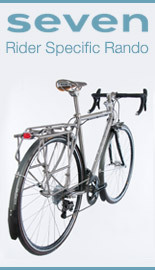 I chose it mainly because I like the way it looks on the bike, at least in the color (silvery-gray) I chose. It has a suede-like texture, which is somewhat akin to the cork, and is a bit softer than cloth. I'll see how it works out for me. I hope I'm not too late to have a little input on this question... The reason the bars on your Trek(where did that bike come fom? I go away for a week or two and you have another neat old bike...) are "square" is because they are for use with aero brake levers and the grooves that make it so square are channels for the brake cables to run in. It keeps them in place and makes it so they don't stick up and make an uncomfortable ridge. If you want to use them with regular levers you can put a cord or something in the groove and wrap the tape over that. If you know someone that works in a hospital you may be able to get some 1/4" surgical tubing that would be nice and firm to use... just an idea for if you like the bars otherwise. Walnut has some nice leather tape options on their Etsy store. I ride shellaced cloth tape with no gloves, and haven't ever felt pain. I've even toured on cloth. That said, my road bike has cork tape. When next you wrap the bars o your Trek, I'd suggest doing it in the opposite direction, so that the overlapped side faces the rider. I find that this is more comfortable and prevents cork tapes from rolling forward and loosening. I prefer cloth tape too. But this weekend I realized I really needed to redo the tape on my bike when I got it out, and I could only find two types at the LBS - cork tape, and some weird bar tape that felt like rubber to my fingers... I got the cork. It looks so wrong on my 32 year old vintage road bike - everything is thin and slender, but the tape(despite being advertised as thin) makes the wrapped portion of the bars look chunky. It also feels wrong - perhaps it dampening out too much road feel of my bike, but I don't recall having ridding newer aluminum and carbon bike's with cork that the road feel through the bars was so dull. But thanks for pointing out cloth tape was on Amazon - I'd rather support my lbs, but I'm afraid I can't keep this cork tape on my beloved bike.